Fairmeadow Farm: Well hello there! Happy fall everyone! Despite much better intentions, it would seem that it's almost October and this farmer has somehow managed to miss corresponding with all of you through this little blog since March. Oops! I hope that you all had a fabulous summer, and have been enjoying the crisp air and sunshine of late too. I am hoping to get back to blogging much more regularly this autumn (and beyond), but for now I just wanted to say a quick hello, share a brief update and post a couple of recipes (since this is such a terrific time of year for cooking! Hooray for the oven/hours of baking being a welcome house warmer rather than a cruel means of torture!). As many of you know, I've been keeping myself busy this year with working at Lavender Blue (a lavender farm just east of Sparta) and being involved with the Ecological Farmers Association of Ontario. Both of these have let me stay well connected to farming this season, and have kept my brain (very) and beloved wheel hoe (somewhat) busy, which has been good. 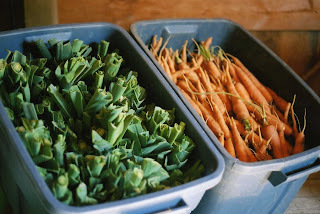 In the spring, Fairmeadow Farm as we knew it though (harvest bins, vermont cart and all) was tidied up for awhile, and put into storage while the thinking and planning and decision-making for the longer term of the farm is underway. Not surprisingly (if you know me at all! ), I am not quite as far along in the process as I had hoped to be by now, but it's not really something to be rushed (and a move, laptop illness (followed by laptop death, sadly), and the general busy-ness of life managed to wheedle their way into things as well)! The focus on planning will recommence shortly though, and thus, there should be more interesting updates to follow. So if you are so inclined, keep reading from time to time. :O) I will say that it was definitely hard and a substantial adjustment not to be farming this summer - and I very definitely missed growing vegetables for all of you lovely people. It really is my hope to farm, the question of the details is what remains. Both of these recipes are rather traditional. This one is adapted from the Flavours of Elgin cookbook, published to commemorate the 2010 International Plowing Match, which was held in the county just last week. If you have a copy, the original is found on p.155. Saute the onion and apple in a large pot over medium heat until the onion is translucent. Add the cloves, bay leaf, cabbage, water, vinegar, maple syrup, and sea salt to taste. Cover and bring to a boil. Reduce heat and simmer until cabbage is tender, about 30 minutes. Adjust seasoning to taste. Remove cloves and bay leaf before serving. From the Fairwinds Farm cookbook. They write: "If you can, use 3 or more different kinds of apples together in a pie or a crisp. The flavour is remarkably deeper. However, any apple will do in a pinch; this is also a great way to "use up" winter apples that have gone soft." Slice unpeeled apples into a bowl and mix with cinnamon, brown sugar, salt lemon juice. Spread into a large baking pan, about 9x12" or so. Mix together all of the topping ingredients until well combined and starting to form nice crumbles. Spread topping over the apples, and bake at 350F for 45 minutes, until bottoming is bubbling and topping is golden brown. I am sorry to hear about your laptop passing on. You should post some pictures of your lavender days.